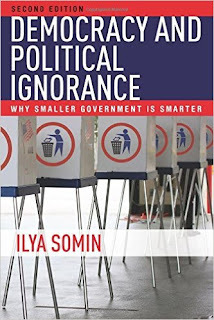 This is part two of a two part interview with Ilya Somin about his book, Democracy and Political Ignorance: Why Smaller Government Is Smarter, which he has revised for a second edition. Part One appears here. JB: Is there a difference in knowledge or ignorance about local politics or state level politics as opposed to national politics or foreign affairs? Does this have any consequences for your argument? IS: It is difficult to make any definitive comparisons between the two kinds of knowledge. But it is clear that both are low. That may, potentially, cut against my argument that people make better-informed decisions when they vote with their feet between different states and localities, than when they vote at the ballot box. But, as I discuss much more fully in Chapter 5, the kind of knowledge that foot voters need is often different in nature from what is useful to ballot box voters. For example, the latter need to know which officials are responsible for which issues, so that they can decide what to reward and punish them for at the ballot box. By contrast, the former merely need to know how well the relevant jurisdictions are doing on measures they care about (job opportunities, housing, schools, etc. ), without having to apportion credit and blame. On that score, foot voters have historically done very well, often even under highly adverse conditions (such as those that faced 19th century immigrants to the US, or African-Americans fleeing the Jim Crow-era South). JB: What role do traditional mass media play in causing or ameliorating political ignorance? What role do the Internet and digital media play? Do new media ameliorate the problems of political ignorance for democracies, do they make things worse, or do they just alter what people focus on? IS: It is a striking fact that political knowledge levels have largely stagnated over the last several decades, despite the explosion of new media. Many people blame the media for political ignorance; if only they did a better job of covering politics, maybe the voters would know more. In Chapter 7 of the book, I explain why this indictment is largely misplaced. While the media is far from perfect, the fact remains that the internet and 24 hour cable news have made it easier than ever before for people to acquire basic political information. It is also easier than ever to look up expert analyses of a wide range of public policy issues from specialists across the political spectrum. The problem is not that information isn’t available in the media (and elsewhere), but that most voters are unwilling to devote more than minimal time and effort to studying it. It is an issue of demand far more than supply. If there were a strong demand for more “hard news” and objective policy analysis, the media would be more than happy to provide it, if only out of a desire to increase their profits. Though the media is not one of the main causes of political ignorance, it may make the problem worse in two indirect ways. First, the internet and social media make it even easier than in the past for people to isolate themselves from opposing points of view, and only look at news and opinion sources that reinforce their preexisting biases. I think the situation in that respect is only modestly worse than in the past, but some scholars are more pessimistic. Second, modern media provide a vast array of entertainment options that many people understandable find more appealing than following politics. Why use the internet to read up on entitlement reform or health care policy when you can instead use it to keep tabs on your favorite movie stars, or Taylor Swift’s latest paramour? JB: Do some people benefit more than others from the phenomenon of political ignorance? IS: Yes, as discussed in my answer in yesterday's post, some political parties and ideologies benefit from ignorance more than others. Ignorance also enables some well-organized interest groups to get away with things that the electorate might not tolerate if they knew what was going on. Some evidence also suggests that the disproportionate political power of the wealthy is in part due to their higher levels of political knowledge. That said, the most important effects of political ignorance is not that it enables some people to win more political battles than they would otherwise, but that it reduces the quality of government and public policy in ways that harm the vast majority of the public. Even those who win an occasional political victory thanks to ignorance often lose out in the long run, because we end up with a poorer and less free society overall. JB: Is this unfair? If so, is there anything we can or should do about this? IS: I think it is indeed unjust when political leaders and interest groups use ignorance to get control of the power of government and use it in ways that harms other people. As Jason Brennan argues in his excellent book The Ethics of Voting, ordinary voters also act unjustly when they cast ballots without making even a modest effort to become informed about the issues at stake. In the words of John Stuart Mill, voting is not just an individual choice, but the exercise of “power over others,” Those who exercise power over others must, at the very least, do it in a reasonably responsible fashion, which includes becoming better-informed than most actually are. There is no easy solution to these problems. But, as I explain in Chapter 5, the best way to make significant progress is to limit and decentralize the power of government, so that we will make more of our decisions by “voting with our feet” in settings where we have stronger incentives to become well-informed. Foot voters have far better incentives to acquire information and use it wisely than ballot box voters do. In Chapter 6, I argue that the harm caused by political ignorance can also be mitigated by strong judicial review. JB: Is political ignorance a more or less permanent characteristic of modern democratic societies? IS: To a large extent, yes. As I discuss in Chapter 3 of the book, most of the political ignorance we observe is not the result of stupidity or lack of information, but of perfectly rational behavior by individual voters. That is the main reasons why political knowledge has not gone up significantly, despite increasing education levels and IQ scores, and despite vastly greater availability of information. But while we can’t do much (at least in the foreseeable future) to increase political knowledge, we can mitigate the effects of ignorance by making more of our decisions in settings where we have far better incentives to seek out information and evaluate it objectively. JB: In your second edition you talk about the "Big Sort." How does this kind of demographic change affect the argument of the book? IS: In my book I argue that we can reduce the harm caused by widespread political ignorance by limiting and decentralizing government power, which will enable more issues to be decided by “voting with your feet” instead of ballot box voting. Foot voters have far better incentives to acquire information and use it wisely than ballot box voters do. One of the criticisms most commonly raised against the first edition is the idea that increased foot voting will exacerbate the “Big Sort”: the possible tendency of people to cluster in communities of the politically like-minded. In a famous 2008 book of the same name, journalist Bill Bishop argues that this trend increases political polarization and our already severe tendency to ignore or dismiss opposing points of view. My proposal to expand opportunities for foot voting could potentially make the situation even worse. The critics were right to raise this issue. I address it in three ways in the second edition. First, it turns out that the data do not support the notion that ideological segregation is increasing. Most people’s migration preferences do not actually align closely with conventional Red-Blue politics. Second, even if increased foot voting did lead to greater ideological segregation, that might not be a bad thing. It might even have some beneficial effects, by increasing the overall diversity of our federal system, and giving potential foot voters a wide range of options. The new edition of the book also addresses the opposite concern: the fear that some (particularly conservatives) have that an influx of migrants into their state will undermine its distinctive political identity because the newcomers’ views diverge from those of current residents. The carpetbaggers might even tip the political balance against those policies that made the state an attractive destination for migrants in the first place. I argue that, like the Big Sort, this sort of fear is also overblown. Both issues are addressed in detail in Chapter 5 of the book. I summarized some key points on both in this recent post at the Volokh Conspiracy blog. JB: I expect that people often ask you about the rise of Donald Trump. Does your analysis help us understand the Trump phenomenon? IS: Sadly, yes. Almost all of the major themes of Trump’s campaign involve exploitation of political ignorance: most notably his positions on immigration restrictions and curbing international trade, and his claim that we can simultaneously maintain gargantuan spending on entitlements without any cuts, make massive reductions in taxation, and address our serious fiscal problems. To take just one example, Trump’s campaign first took off when he famously claimed that Mexico is sending us criminals, murderers, and rapists. In reality, social science studies consistently show that immigrants – including Mexican immigrants – have a much lower violent crime rate than natives. Survey data indicates that 50% of Americans (and over 70% of Republicans) don’t realize that, and instead believe that immigration increases crime. However, it is important to recognize that Trump’s exploitation of political ignorance differs more in degree than in kind from what more conventional politicians do. In the present campaign, Bernie Sanders has also taken advantage of various types of ignorance with great effectiveness (including, on trade and government spending, some of the same ones as Trump). President Obama and more traditional Republicans are also not above using such tactics. I discuss the role of ignorance in the 2016 campaign further in this recent CNN op ed.